Steam the pumpkin until soft. Heat 1 tablespoon olive oil in a saucepan. Sauté the shallots for 3 minutes over medium heat, stirring constantly. Add the kale, and keep stirring until the leaves are completely cooked (about 3 more minutes). Transfer to a blender, and process with the cooked pumpkin, 2 tablespoons Parmesan cheese, 2 tablespoons half & half or heavy cream, 1 tablespoon maple syrup, 1/2 teaspoon nutmeg, salt and pepper. If the mixture is too thick, add more half & half or heavy cream. You want it to have the consistency of mashed potatoes. Taste and add more maple syrup, nutmeg, salt, and/or pepper, according to your taste. Put a wonton wrap on a dish. Wet the tip of your finger with water, and pass it along the four edges of the wrap. Place 1 teaspoon of the pumpkin and kale filling in the middle of the square, and fold diagonally, forming a triangle. Press the edges with your fingers to close the ravioli, making sure that you don’t press the center and push the filling out. Cover a large tray with flour, and start putting the ravioli side by side. Repeat the same process until all the wonton dough or all the filling (or both), have been used. Bring a large pan with water to a boil. Add 1 tablespoon of salt, and add the ravioli. You can do this in two batches if your pan is not big enough to cook all the ravioli at once. The ravioli are ready when they float (it will take about 2 minutes). Take them out of the pan with a slotted spoon, or with any large spoon, and transfer them to a colander. When all the ravioli are ready, discard the water, put them back in the pan, and mix well with 1/4 cup olive oil. Cover. Heat 1/2 cup butter and the garlic slices in a frying pan over medium heat. Stir constantly for 1 minute, and turn off the heat. Serve the ravioli in four plates, pour some garlic butter over each plate, and sprinkle with some more Parmesan cheese. You can freeze the ravioli before cooking them, for up to a week, and take them out of the freezer a couple hours before using. You can also use the filling of these ravioli to make lasagna layers, or to replace mashed potatoes. I'm not going to lie to you. Making ravioli at home can be labor intensive. However, the result is always well worth the time and effort you put into preparing them. 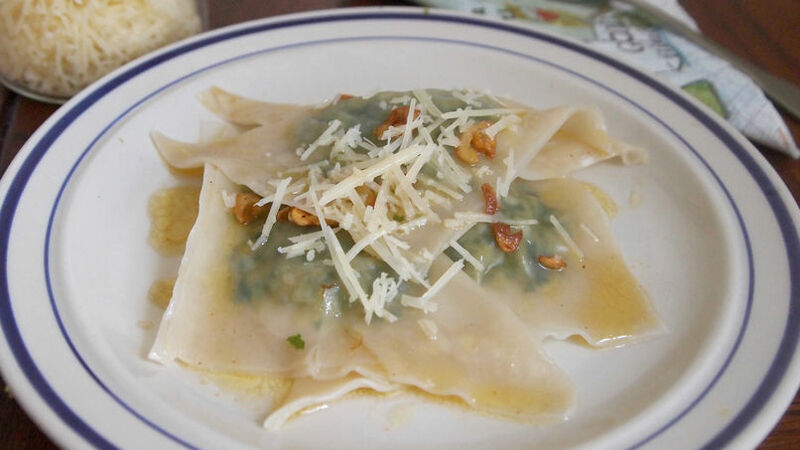 I learned to make ravioli at home when I was a teenager and my mom used to fill wonton wraps with pumpkin, fold them in the shape of ravioli, and keep them in the freezer for days or weeks. Whenever any of us felt like having some fresh pasta, she would take them out, cook them in the blink of an eye, and add only garlic and sage on top of them. They were so tasty that they didn't need anything more! To this day, filling my ravioli with pumpkin and using only butter as a sauce is my favorite way of eating them. But today I've taken this simple recipe a bit further, adding some greens and a little maple syrup to the filling. The latter is my new favorite ingredient, and it brings a delicious earthy sweetness to it. Together with nutmeg, it makes me feel like fall. Happy cooking and happy fall!